During the recent presidential campaign the phrase "draining the swamp" was often used by candidate Donald J Trump. It is now been over 5 1/2 months since Trump took the oath of office and in many of his critics have suggested that the swamp remains full. Of course, part of the delay in draining the swamp has been the inability of Trumps cabinet to be confirmed. This delay can be laid squarely at the foot of the leadership of the Democratic Party which used procedural tactics to delay the confirmation of Trump's cabinet nominations. 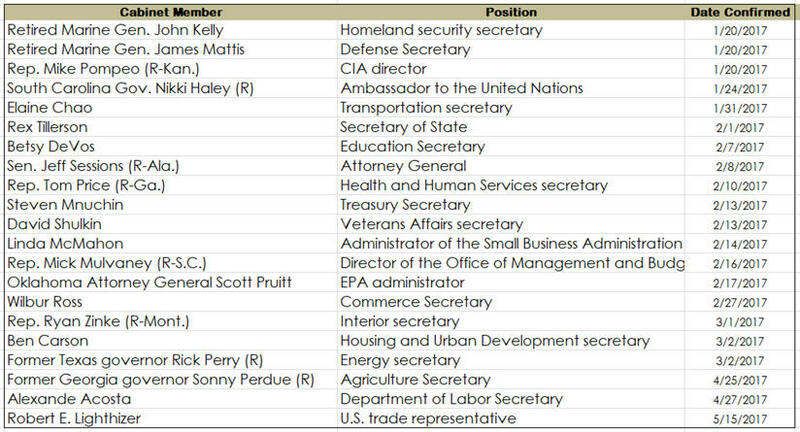 The following table shows the Trump cabinet with the date of their confirmations. It took 114 days from Trump's inauguration until the final member was confirmed by the Senate. Only one of Trump's nominees failed to get confirmed and Andrew Pudzer withdrew his nomination as Secretary of Labor. Moreover, President Trump has nominated 216 individuals for civilian positions in his administration. To date, the Senate has only confirmed fewer than 50. Though the Republicans have the votes to confirm the nominees, the Democrats have used procedural devices to obstruct the process at every turn. They have walked out of committee meetings to prevent a quorum to delay voting and cite paperwork delays as a reason to stall a nomination. If a nominee gets through the committee, the Democrats often resort to filibustering the nomination. Thus, due to the regulations and laws governing civil service employment the ability of Trump and his cabinet members to pull the plug quickly was hindered. One of those regulations which impedes changes in various agencies is that civil service employees cannot be transferred to different locations and/or a different job classification until after 90 days of a cabinet members confirmation. Thus, at the end of June 2017, the period during which some of Trump's cabinet members can transfer civil service employees is just beginning. You might expect that these transfers could result in the retirement and/or resignation of many government employees. Over the years, the inability of a political party to change many of the government employees has led to the creation of what many refer to as "the deep state." Immediately prior to the end of an administration, many of the appointees find employment in civil service jobs which provide protection for their points-of-view. Many years ago, I suggested that individuals should only be allowed to serve a total of 20 years of service in any governmental position at any level except those who served in the military. The U.S. is now showing a stated-cash debt of approximately $20 trillion with a Gross Domestic Product of $18 trillion. Of course, the real nominal debt is north of $200 trillion according to the GAAP report from the U.S. Treasury for FY 2016. The ability to fund that debt lies wholly within the U.S.'s role as the world reserve currency. During the past five years, many moves have been undertaken by both our allies and countries that are not particularly friendly to the U.S. to reduce the role of the U.S. dollar. The U.S. dollar could be facing a major revaluation and thus, the standard of living would be seriously affected. Most politicians are reluctant to acknowledge the increasing risk. For years, the U.S. has relied on a strong military presence to help offset any economic risk to the role of the U.S. dollar. However, at the moment, thanks to the Obama downsizing, the military has been stretched thin and many of its units are far from combat ready. The war on terror and the integration of women into front-line combat units has eroded the military ability to fight a two-theatre war. In order to reduce that threat, the Trump administration only has a few options ... reducing the reliance on debt financing and improving the status of the U.S. dollar. To drain the swamp, here are a few suggestions for President Trump. Terminate John Koskinen as Commissioner of the IRS. Shut down the Federal Reserve. Send to Congress nominations for all open Federal judgeships. Remove all non-Civil Service employees of the FBI. Propose a Constitutional Amendment that limits Senators to 2 terms and members of the House of Representatives to 4 terms. Reorganize all the intelligence agencies into just 3 organizations ... domestic, foreign and cyber. Trim 10% from the budget of each governmental agency and set sunset requirements for all government funded programs. Push all government pension programs into 401(k) programs effective with the FY 2018 budget. All government health insurance programs must become private. Insist that the Department of Justice apply the Sherman and Clayton acts to the health-care and pharmaceutical industries forthwith. Terminate all foreign-aid programs both humanitarian and military. With the opposition party clearly in an obstructionist mode, it is past time to play nice. The U.S. is facing bankruptcy and strong measures are required. If Trump fails to take strong action against his opposition, the U.S. could very well be headed towards a "Convention of the States" and then everything is on the table.